^ Topilko, Piotr; Schneider-Maunoury, Sylvie; Levi, Giovanni; Baron-Van Evercooren, Anne; Chennoufi, Amina Ben Younes; Seitanidou, Tania; Babinet, Charles; Charnay, Patrick. 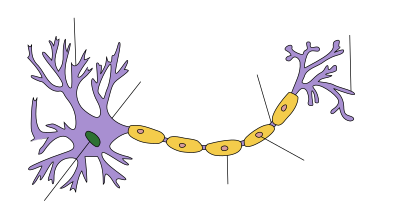 Krox-20 controls myelination in the peripheral nervous system. Nature. 1994-10-27, 371 (6500): 796–799. doi:10.1038/371796a0 （英语）. 波士顿大学上的组织学： 21301loa—"Ultrastructure of the Cell: myelinated axon and Schwann cell"